Provided by Aude Billard, EPFL, Lausanne, Switzerland. Robota is a 45 cm high, humanoid robotic doll. The main body of the doll contains the electronic boards and the motors that drive the arms, legs and head giving 1 DOF to each. The robot has also the capability of being connected to various sensors such as infrared emitters/ receivers, light detectors and more. The robot has been used extensively by Ben Robins as part of his PhD research. 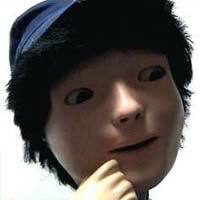 For more information on the doll robot see: Billard, A. (2003) Robota: Clever Toy and Educational Tool. Robotics & Autonomous Systems, 42, 259-269.